The following press release was received via Email on August 3, 2016. As stated below, more information is available by clicking on the ALB and the Pool Survey webpage. If you own a pool, look for ALB in your pool filters. 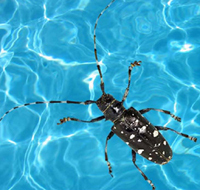 Pool owners are invited to join in the New York State Department of Environmental Conservation (DEC) fifth annual Asian longhorned beetle (ALB) Swimming Pool Survey now through August 30 to help keep watch for these exotic, invasive beetles before they cause serious damage to our forests and street trees. The Citizen Pool Survey takes place this time of year when ALBs are expected to emerge from and become active outside of the trees they are infesting. ALBs are originally from Asia and have caused the death of hundreds of thousands of trees across the nation, particularly in maple trees in: New York City; Long Island; New Jersey; Chicago, Illinois; Worcester, Massachusetts and Clermont, Ohio. DEC’s Forest Health Program developed a simple and easy survey for people to participate in who have swimming pools and are willing to keep an eye out for these insects. Pool monitoring offers a simple, economical approach to surveying for ALBs in the state and has the potential to become New York’s most effective method for detecting the invasive beetles. In addition, this monitoring program gives residents the ability to take an active role in protecting the trees in their yards, communities and forests. With citizens involved in looking for this pest, there is a better chance of finding new infestations early, helping DEC and other state and federal agencies focus their efforts to eliminate infestations. A digital camera or phone that takes photos. The ability to send a photo via email or text message. Those that don’t have a pool can still help. DEC expanded its photo collection to include anyone who spots a suspect beetle, whether it is found in their pool or not. Residents are also encouraged to submit photos if they believe they’ve found an emerald ash borer (EAB) (see what it looks like on DEC’s EAB web page) or another invasive pest damaging trees. Photos can be submitted to the forest health program email address listed below. Step 1: Through the month of August (when adults are active), check the debris collected in your filter and skimmers at least once a week or when you clean your pool. Step 2: Look for the ALB (See what it looks like on DEC’s ALB web page). Contact the Forest Health Program (see phone number and email address below) for a sheet to help identify insects collected. Step 3: Take a picture of any insect you think might be an ALB. Step 4: Send the photos of the insects that look like ALB to foresthealth@dec.ny.gov. Step 5: Freeze the insect in a plastic container until DEC staff respond (typically that will be about a week). Staff will either instruct the participant to discard the insect or give instructions on mailing it, delivering it, or arranging for pick-up.